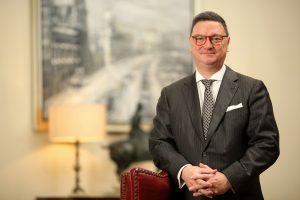 Shanghai, China, April 7, 2016 /ChinaNewswire.com/ - Hilton Worldwide today announced the appointment of Rudy Oretti as general manager of the Waldorf Astoria Shanghai on the Bund. Rudy Oretti reports to Daniel Welk, vice president luxury – Asia Pacific, Greater China & Mongolia, and he is responsible for managing the overall operations of the hotel. Oretti joins Hilton Worldwide from Louis XIII Management Limited in Macau, where he held the position of senior vice president – operations. Oretti brings more than 27 years of hotel experience in multiple leadership roles throughout APAC, including general manager positions at Banyan Tree Macau, Banyan Tree Bali and The Leela Palace, Bangalore. Oretti has a Master’s Degree in Business Administration and Post Graduate Diploma in Marketing from Cardiff University. He is also a Fellow of the Institute of Hospitality (FIH) and a Member of the Chartered Institute of Marketing (CIM) of United Kingdom.